An invitation to read with students ( grades 7 to 9) of the newest centre of our VIDYA Bhavishya Yaan Program at Mazagaon, was certainly a cause for cheer. The reading duo of Bhasyati Sinha and Jayshree Murali marched across from the northern end of the suburbs to the island city of Mumbai with glee. 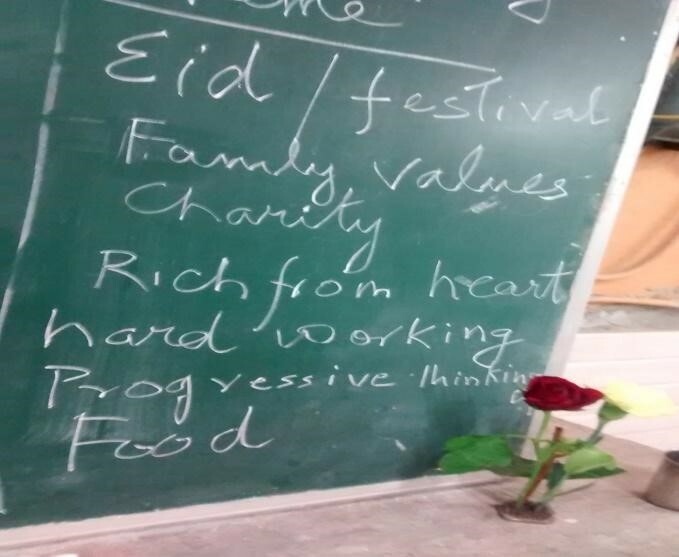 A lot of planning with Faika , our lovely teacher from the BY Program, went into presenting Ismat’s Eid. The idea being engaging with the story , uncovering its layers , to get the children interested in reading books, making them think and of course enjoy the process. The school was undergoing renovation and in the noisy clutter, our little classroom seemed a haven. We set up a library corner on the makeshift table, with books arranged neatly . We also set up a separate space for the props for the story and an art corner with crayons and colours. Faika had brought a dupatta, burqa and bangles with trousers and scissors. A patched pair of jeans was hung from a hook. A colourful display of printouts of kitchen scenes and a cooking vocabulary dotted one wall. A beautiful handprint of a mosque, with the Gautam Nagar children’s thumb impressions added the colour to the Library Corner. As the children entered the classroom and flocked to see the books, they were wondering what was going to happen. We started with a brief introduction of ourselves and a warm up song . Then we asked them “why are we here”? Some guessed “ to read a story,” while others said they had come to learn . We quizzed them “who owns this classroom”: The children’s reply were many, from ‘ Manisha mam, MCGM, the teachers and some said the students. The children agreed that they were the owners in a big way, and as owners they would determine how the class would be. So a classroom agreement that said Good Language, Respect for others . One should listen quietly when someone is talking, Participating freely, Encouraging their team mates , mobiles off were some of the rules that were framed. This set the ball rolling, immediately the children were drawn to the advertisement. We asked what they saw. They said that they could see that the boy was helping the man. The boy gathered other boys to help the man. His clothes were soiled as he carried the samosas on his kameez. And that there was a lot of non verbal communication. The child helped a random person. Also some said that the mother was not angry even if his kameez was soiled. The connection with Eid having been established, Jayshree showed them the book. She spoke about the author, Fawzia Gilani Williams, her background as a Librarian / Educator . She also spoke about the illustrator Proiti Roy. She then shared a little about where the story was set – Turkey and proceeded to do a Read Aloud of the Book. The read aloud demanded that the children be completely focussed to listen and enjoy the story. She read with a lot of passion and impersonated for Ismat, while Bhasyati joined in for the other characters. And the props popped up , when they had to. The story was in simple language and the children were able to understand it A couple of places , we paused for prediction. This section was lively with the children having taken over it. When quizzed about Ismat if he was a progressive man, some said he was. Had it been any other man he would have slapped his wife for not doing his bidding , and also for ruining his pants. Some said that though he was a poor man he bought something or the other for his near and dear ones. Some said that he was of adjusting nature and he was happy with the stitched pant. One child said that he even gave money to the poor though he himself was poor. Then we asked about the setting: the students replied that it could be a village or a city. The Text to Self having been firmly established, we then looked at Text to Text and Text to World connections. The children kept thinking, and Faika said she found resemblance with the book ‘The Elf and the Shoemaker’. Ismat was a shoemaker indeed, and the children recalled the story. Jayshree then prodded more about the book . The children then said that everyone should be able to enjoy festivals. We should not waste food, as so many people go to bed hungry. They spoke of wastage at weddings and festivals. Some spoke about farmer’s suicide – why it happens. One boy said that shortage of rain, could be one of the reasons, while other said that lack of irrigation facilities. Another theme that emerged was celebrating festivals together. This happened as we discussed if any religious celebration was for only the community who practised the religion. The children were emphatic that Festivals were for Everybody and that we must Celebrate Them Responsibly. We also touched on InterFaith Harmony. Choral Reading : Bhasyati then took over this segment. She explained, while reading we should stop at full stop, pause a little at comma. We should modify our voice when we are reading out the dialogues for different characters. She then read out each sentence with expression and the children read after her. And she asked questions in between for comprehension. Naturally ! 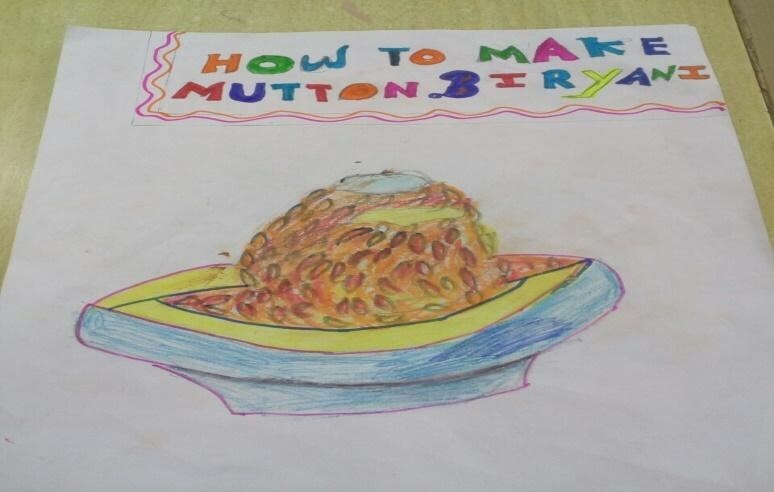 The post reading activity was Recipe writing and Poster Making. The children could choose one activity for now and do another activity at the next class. For recipe writing they had to pick a Festival Recipe of their Choice and write it down. While the second activity was making Posters for ‘Celebrating Responsibly’, where the festival is of their choice . We were amazed by their work. 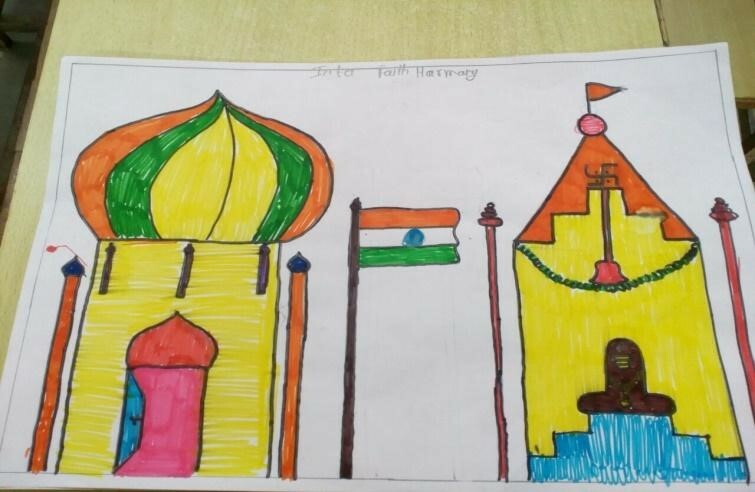 A group of girls drew a poster of a Shiva temple and a Mosque. They read out that all religions should celebrate festivals together. Festivals mean a time to bond with others. A group of boys did a poster on Diwali. They highlighted on the pollution that is created by bursting crackers, about wasteful expenditure during festivals. The third group wrote the recipe of grilled sandwich to the minutest of detail, including garnishes. 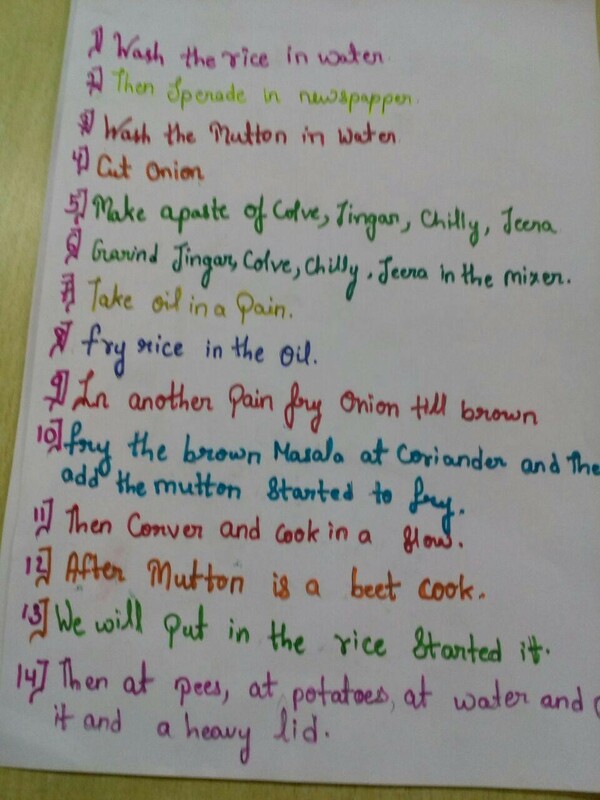 and the fourth wrote the recipe of Mutton Biryani with all the specifics, and also spoke of Dalda irritating their throat. The Fifth sweetened it with a recipe on Shahi Tukda. They then presented in groups their Recipe/ Poster, with applause for every group coming in. The session ended with a beautiful prayer from The Koran , that spoke of Unity. The story , as always is the hero alongside the children!